Don't forget to save the dates for the 2019 conference! So that our children can have a fun and safe time while caregivers get the most from the sessions, CSFN provides professional child care at the conference at Camp RAS for children 1 through 17. The CS Lounge is a place for adults with CS who are 18 or older to gather, visit, do crafts and have fun. You will need to register your child for Camp RAS or for the CS Lounge, and rates will remain the same as 2017. More information will be available soon on the CSFN website. Braden loves books! The word “love” often gets thrown around casually nowadays. But, I can honestly say that he truly, and wholeheartedly, LOVES books. Braden first showed a strong interest in books around the time he turned one. He has never cared much for traditional children’s toys - books are his toys. He loves nothing more than flipping through the pages of his favorite stories. You will rarely see him without a book in his hand – no matter if he’s at the zoo, a ballgame, shopping, beach, playground, swimming pool… you get my point. And, not just any old book will do! He’s very particular about what he wants to “read” and will not let you pick out a book for him. Over the years we’ve bought multiple copies of some of his favorites, because he will flip through them until the pages fall out. They are his passion. 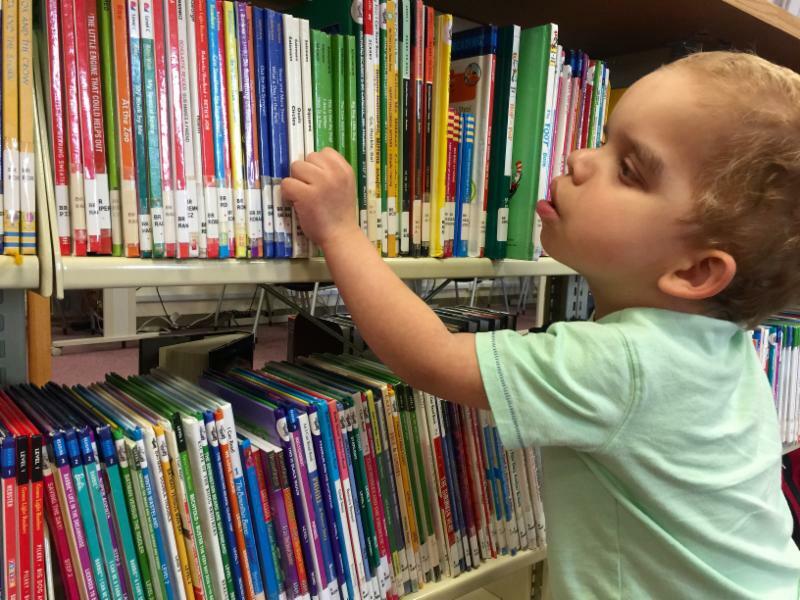 If you want to become Braden’s friend, it’s simple – offer to read him a book. He might ignore you at first, but if you ask him if he would like to read a book…. he’s your buddy! He would love nothing more than to listen to someone read to him from morning until bedtime – or when your voice goes – whichever comes first. I can’t begin to estimate the hours that our family has read to Braden over the last 8 years. When you ask Braden where he wants to go, you will most likely receive the response of “library” or “bookstore”. Both places bring him joy. Don’t bother with toy stores - they aren’t his thing. I’ve wasted more money than I care to admit buying various toys for him. I’ve finally embraced the fact that he only wants books, and it makes gift buying very simple. Everyone knows what to buy him for birthdays and Christmas! He’s amassed quite a personal library. Braden has not yet learned to read. However, he has the most amazing memory, and often helps me “read” his books. My hope is that Braden will eventually learn. This obviously isn’t a stage or fad for him, and I can only imagine the happiness he will feel when he reads and understands all of the words on his beloved books! Our goal for the 2019 conference is $70,000 and your fundraising efforts beginning June 1, 2017 through September 30, 2018 have totaled $28,364. We have a ways to go but I know many of you have been working on your own fundraising projects. Thank you! #GIVING TUESDAY is November 27, 2018, and we have posted an invitation to support CSFN in this global event on our Facebook page. Facebook does not take any fees so CSFN receives 100% of the funds. It would be great if everyone would donate even just $10 or $25. You can find information to donate on Facebook here or the button on the bottom of this page. Our website contains more information on how to make donations too. Be sure to share with family and friends. CSFN is excited to team up with The Sheets Lady again to help raise money for the conference next year - and it starts immediately--just in time for the Holidays. We will again be selling Luxury 1200 thread count bed linens from November 14 to December 2. The sheet sets sell for $40 per set (any size) and CSFN earns $10 per set. Extra pillowcase sets are available at $15 for a King set and $12 for a Standard set (no funds raised on these). Funds you raise will apply toward incentives. The sheets can only be shipped in the US. Address questions by email to Amy at amythesheetslady@gmail.com. You can pay by check or arrange with Amy to pay by credit card, PayPal or Venmo. YOU made the Sheets Sale very successful last year and together we raised $3,300. Sandra is happy to help or answer questions too. Let's see if we can exceed the funds raised last year!!! Be the first to read the latest news from CSFN. You may join our mailing list by clicking on "Sign Up For Updates" on the home page of our website--just click on the button below. You may opt out at any time.